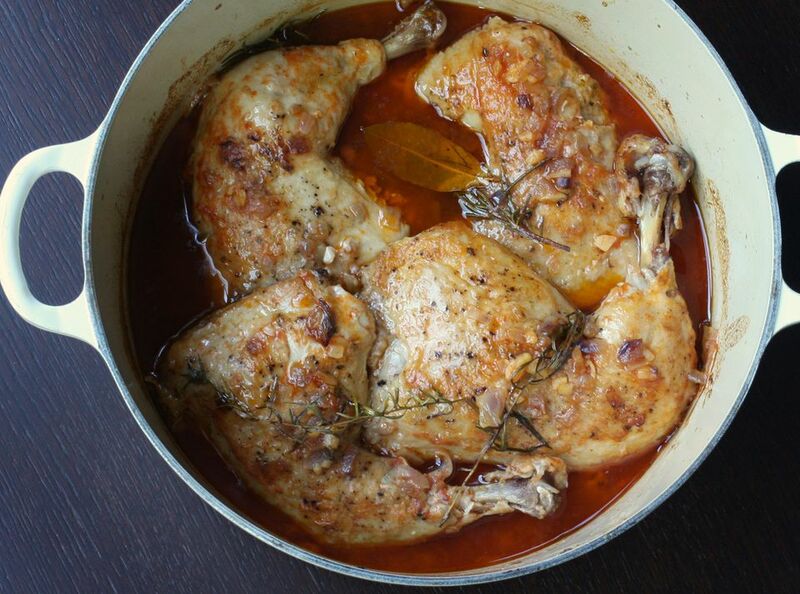 Garlic and rosemary flavor these delicious chicken legs, and a little tomato paste white wine make a hearty, rustic broth. I used whole chicken legs in the recipe, but you could use drumsticks and thighs or just thighs. Braising is an excellent cooking method for chicken legs and thighs. In a large deep oven-safe sauté pan, Dutch oven, or saucepan, heat the olive oil over medium heat. Add the onion and cook for about 3 minutes, stirring periodically. Add the garlic and cook for about 2 minutes longer, stirring from time to time. With a slotted spoon, remove the onion and garlic to a plate and set aside. Lightly sprinkle the chicken pieces with salt and pepper, then dredge in the flour to coat. Brown the chicken for about 5 minutes on each side. Add the onion and garlic back to the pan. Whisk the wine and tomato paste together; pour into the pan and add the bay leaf. Boil for about 1 1/2 to 2 minutes, until the liquid is reduced by about half. Add the chicken broth and rosemary sprigs. Cover and braise in the oven for 1 hour, or until the chicken is tender. The thickest part of the chicken, not touching bone, should register at least 165 F on a food thermometer.